The phone chargers I’ve reviewed and fully load tested before have all been from reputable brands such as Anker, Aukey and Tronsmart. So that these power supplies would at least be of decent quality was kind of expected. This time, I chose just on looks and specs. I liked how this charger looked and the specifications it supposedly has looked good too. There was no brand though and that’s always a risk. 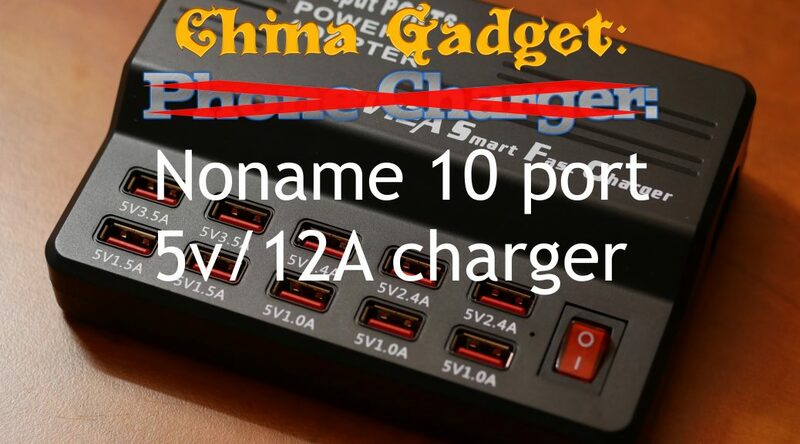 Because I’d rather have you first watch the video then just read how it did, I’m first listing where you can get the charger yourself. If you SHOULD get one I leave that all up to you, but be sure to watch the video and read on below! Well, as I already feared when I ordered this charger, not that great. Or rather, it has some nice features but the downsides that come with it makes this a bad charger in the end. The things it does well is having a three prong power connector (I have lots of those) with an internal power supply and being able to deliver up to 4.0 Amps on one port! That’s the highest value I have ever measured. Actually, even my EBD-USB can’t measure higher than that! What did it badly? Well, that three prong connector has no earth connected internally. The internal power supply is clearly re-used or at least wasn’t originally meant for this charger. And then there is the noise, so much noise when you don’t load the charger above at least 4.0 Amps in total. It’s clearly switching noise from the power supply, but there is no reason to have it this audibly anymore nowadays. Also, with the charger connected to the EBD-USB and through it connected to my laptop my touchscreen would go completely haywire. I’ve seen this effect before with other cheap chargers connected to my tablet or phone. I suspect it’s a grounding issue. 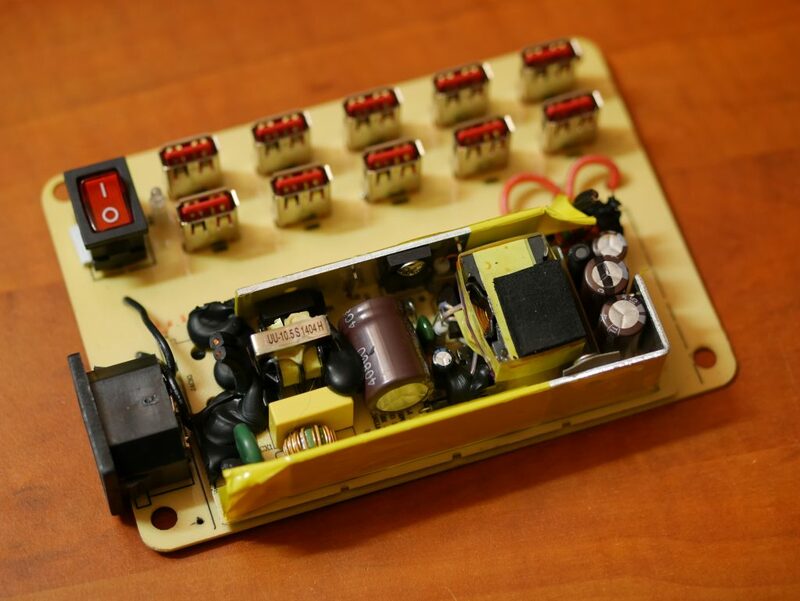 A look inside, do you see those wires sticking out of the power supply? Clearly not it’s original purpose! Total power output was also kind of odd. Using my variable loads I couldn’t get it to provide more than 8.0 Amps in total, but using the EBD-USB with a 4.0 Amp draw I got it to about 9.50 Amps in total! Temperatures were ok. During a 12 minute 9.50 Amps test I measured around 59 degrees Celcius on the outside. That’s not great, and I wonder about the temperatures inside since the parts that get warm are not directly connected to the outside chassis like with some other chargers. The board design also isn’t the greatest I’ve ever seen but it’s also certainly not the worst! As always, I did a few tests to see how well the charger behaves. In most of these tests, the charger actually did pretty ok. Since this device doesn’t support Quick Charge all tests are 5v. As you can see, all these ports did exactly the same. Looking at the internal PCB layout above makes complete sense. The print on the plastic next to the ports is just cosmetic, there is no regulating of any kind going on. Still, 4.0 Amp for a single port is the highest I have ever seen, from any charger! 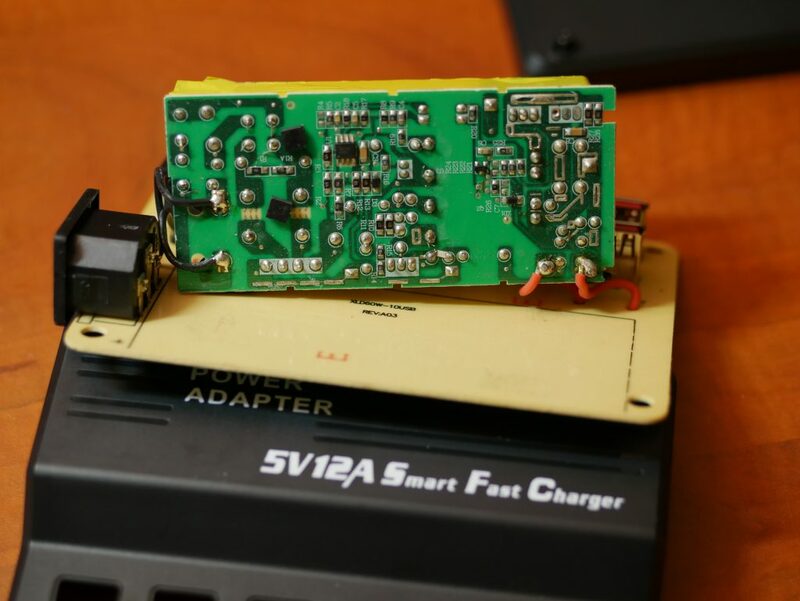 So even while the charger is loaded with 2x 5v 2.0 Amp it can still deliver up to 5v 4.0 Amp to the EBD-USB. That’s actually pretty good! This test was with the EBD-USB running at 5v 4.0 Amp and also having 4.5 Amps (2x 2A + 1x 0.5A) connected with my variable testers at the same time. I left it running for about 12 minutes and during that time the outside of the charger went up to 59 degrees Celcius. Actually, it did pretty ok in this test. Over time there was some voltage sag but all in all, it’s actually pretty well behaved. The voltage also didn’t fluctuate that much. And even total voltage, although it would drop a bit with more load connected, still stays high enough to warrant it pretty ok. So this charger is kind of a mixed bag. On one end it’s able to deliver 4.0 Amps continuously on a single port, even while serving an additional 4.0 Amps to other ports at the same time. That’s pretty ok.
During my standard 3x 5v 2.0 Amps test it pulled 39.5 watts from the wall making it about 75% efficient. Not great, not completely horrible either. 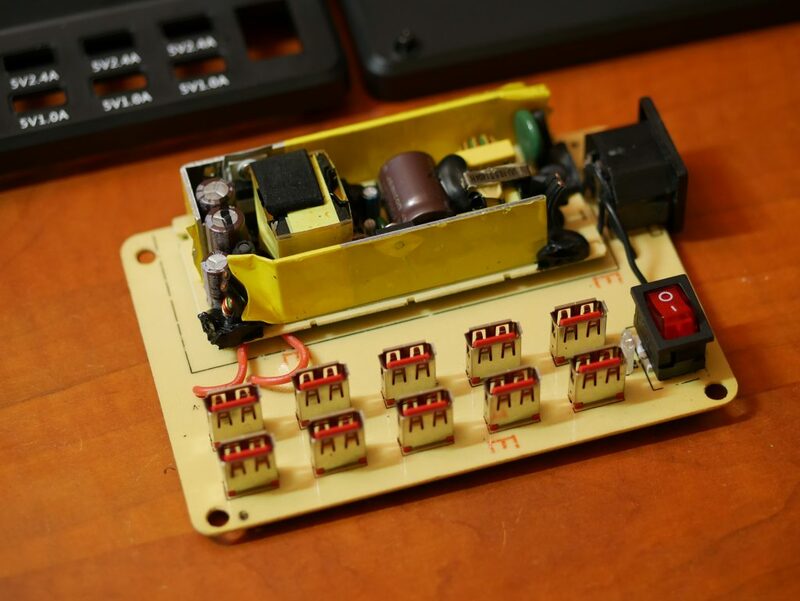 Does it actually deliver 5v with 12 Amps? No. It might be designed to do so, but the internal power supply certainly can’t in my case. 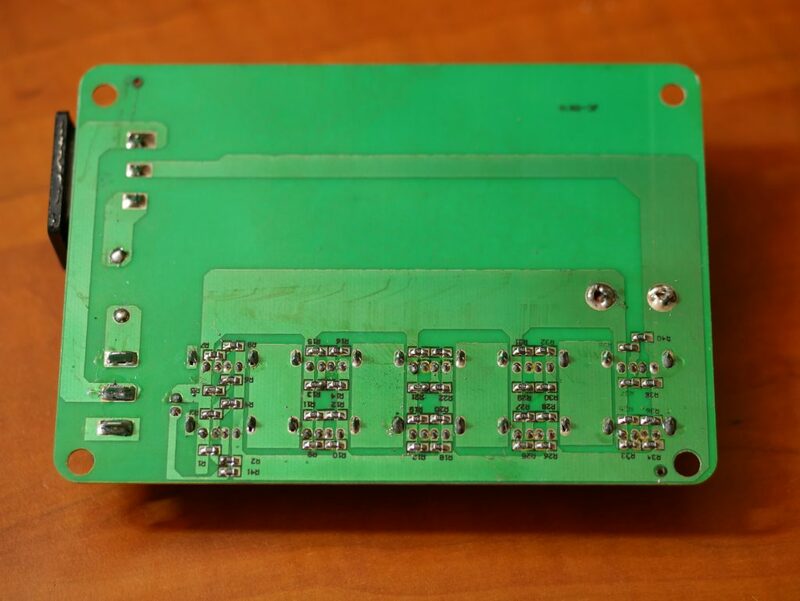 The board design does state on the PCB that it’s designed for 60 watts so maybe they just put a cheap power supply in? But the noise and touch screen issues alone are enough to not be able to recommend you buying this power supply. Too bad, I really like how it looked! Previous PostESP8266 LED Lighting: Setting voltage and flashing NodeMCUNext PostWhat do I do with all those phone chargers?